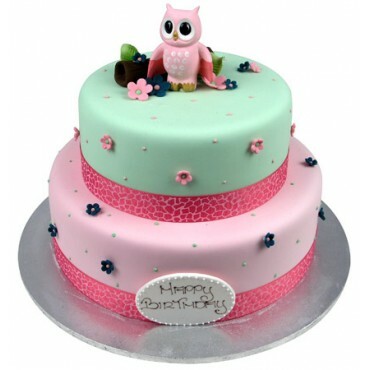 This delightful, colourful two tier cake is decorated with sugar blossoms and piped sugar dots. On top of the cake sits a hand painted porcelain owl, nestled amongst a hand made sugar log, flowers and leaves. 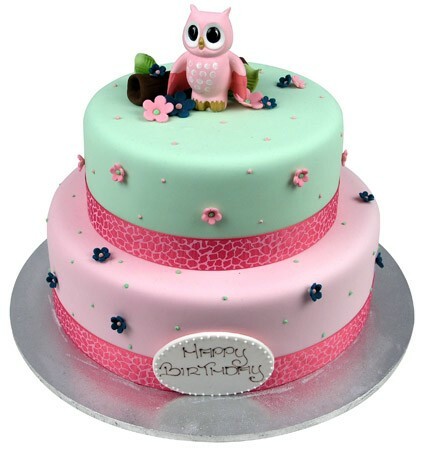 This delightful two tier cake has pale pink icing on the bottom tier and pale blue on the top. Both tiers have a printed pink ribbon wrapped around the base. The bottom tier is decorated with tiny navy blue sugar blossoms and green sugar dots. The top tier is decorated with pink sugar blossoms and sugar dots. On top of the cake sits a hand painted porcelain owl, nestled amongst a hand made sugar log, flowers and leaves.